The Marvel Tsum Tsum Mobile Game has two main modes of game: Puzzle which is very similar to the original Disney Tsum Tsum Mobile Game and Battle Mode. We will discuss Puzzle mode here while you can see information about Battle Mode by clicking here! In puzzle mode the goal of the game is to clear Tsum Tsums by connecting them to form chains of 3 or more Tsum Tsums. The more Tsums in your chain, the higher the points and coins you will get. In addition, if you create chains quickly enough, for each chain you create you will increase your "Combo". You will get more bonus points the higher your combo is. Puzzle mode games are timed and start at 60 seconds. It is possible to increase the time left in the game by entering Mega Charge, popping Time Bubbles, or using some characters powers (see below for more information). During the game there is a special "Mega Charge" mode. When you are in Mega Charge you will earn bonus points. You enter Mega Charge after you have cleared a certain number of Tsums and lasts 10 seconds (You can see the gauge at the bottom of the screen to see how close you are to entering Mega Charge or how long is left if you are already in Mega Charge). Whilst in Mega Charge mode there is no time limit attached to the "Combo" counter achieved when clearing Tsums in rapid succession. Also, each time you enter Mega Charge you will get 5 seconds added to your game timer! If you run out of time and you still have bombs the game will give you a "Last Bonus" and automatically pop them for you... you won't get any additional benefit but at least you will get the points and coins for clearing the Tsums with the bubble. Also if your character's power is fully powered up it will do a "roulette" with the characters in the game. It will clear all the Tsums of the "winning" character. 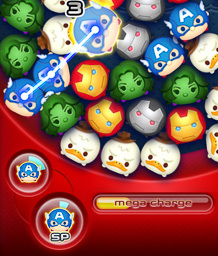 Discuss the Marvel Tsum Tsum Game Puzzle mode!